With its mild weather and chilled-out vibe, Portland is a near-perfect vacation destination. For parents, there's an award-winning microbrewery or funky coffee shop (or both) seemingly on every corner, not to mention more than 500 food trucks roaming the city. Kids will love the zoo, parks and playful museums (there's one devoted to race cars, and another to trains). 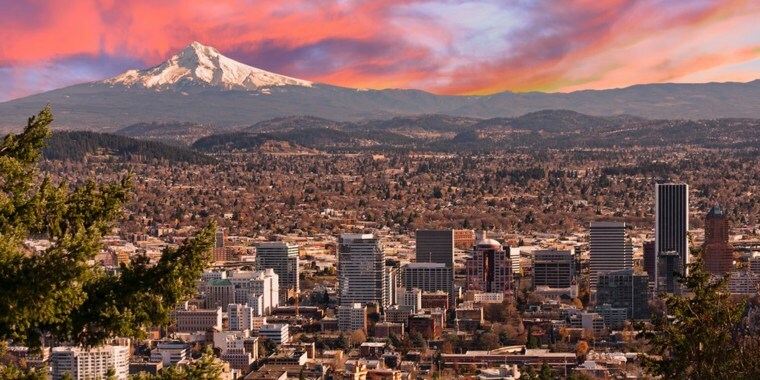 Portland also offers easy access to some of Oregon's loveliest scenic areas, like the Columbia River Gorge, the Willamette Valley and Mount Hood. You could easily spend several days exploring Washington Park, which is right in the heart of the city and home to some serious PDX heavy hitters, including the International Rose Test Garden (with almost 600 varieties), the Oregon Zoo, the Portland Children's Museum and the Portland Japanese Garden. At the Oregon Museum for Science and Industry, kids can tour a naval submarine, stargaze at the Planetarium or get messy with sand or Flubber at the sensory-focused Science Playground. Need a break from the city? The 600-foot Multnomah Falls is just 30 minutes east of Portland. It's an easy (.2 mile) walk to Benson Bridge, which spans the falls at the base of the first tier—a family photo-op in the mist is a must! The centrally positioned Kimpton Hotel Monaco Portland, which Architectural Digest named "Oregon's Most Beautiful Hotel," makes kids feel as welcome as their parents, offering pint-size bathrobes, welcome gifts and dedicated juice and snacks during happy hour. Rooms are done in a distinctive style that reflects back the city's mismatched aesthetic, with fun touches like bird-print wallpaper, funky plaid textiles and tufted headboards. The Mark Spencer Hotel puts you in close range (a two-minute walk) to the famed Powell's City of Books, along with other must-stops like the art museum and Pioneer Courthouse Square, home to the city's weekly summer farmers' market. There are several accommodation styles that would work for families, including corner king rooms, executive king suites (both come with extra sleeper sofas) and double queen rooms. Some restaurants make it clear they'd rather not cater to the littlest diners. Then there's the original Hopworks Urban Brewery on Powell Street, which has a playspace with toys and a train table to keep kids busy while they wait, and a carefully considered children's menu that even includes individual jars of Earth's Best baby food. Along with classics like the bestselling organic IPA, the beer menu has intriguing choices like a kombucha sour ale, grapefruit pilsner and a coffee stout. Portland is known for its over-the-top doughnuts, and it's worth doing a taste test to compare the over-the-top concoctions of Voodoo Doughnuts with the airier, more rarified treats (like Raspberry Rosemary Buttermilk) from Blue Star Donuts—we're sure your kids will be up for the task.